It’s an all-new story for American Horror Story this season. Will the TV series be a big ratings hit once again or could it be cancelled instead? Stay tuned to find out. 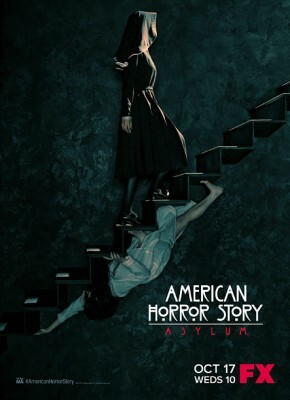 The second season (American Horror Story: Asylum) typically airs Wednesday nights on FX. The cast includes Jessica Lange, Lily Rabe, Joseph Fiennes, Zachary Quinto, James Cromwell, Sarah Paulson, Evan Peters, and Lizzie Brocheré. Final season averages: 1.4 rating in the 18-49 demographic with 2.53 million total viewers. 1.3 demo rating (0% change) with 2.29 million (-1% change). Season averages: 1.44 in the demo with 2.53 million. 1.3 demo rating (-13% change) with 2.30 million (-8% change). Season averages: 1.45 in the demo with 2.55 million. 1.5 demo rating (+25% change) with 2.51 million (+13% change). Season averages: 1.46 in the demo with 2.57 million. 1.2 demo rating (-8% change) with 2.21 million (0% change). Season averages: 1.46 in the demo with 2.58 million. 1.3 demo rating (-7% change) with 2.22 million (-6% change). Season averages: 1.49 in the demo with 2.62 million. 1.4 demo rating (+8% change) with 2.36 million (+4% change). Season averages: 1.51 in the demo with 2.67 million. 1.3 demo rating (+44% change) with 2.27 million (+20% change). Season averages: 1.53 in the demo with 2.71 million. 0.9 demo rating (-44% change) with 1.893 million (-32% change). Season averages: 1.57 in the demo with 2.78 million. 1.6 demo rating (+7% change) with 2.78 million (+5% change). Season averages: 1.70 in the demo with 2.96 million. UPDATE: FX has ordered a third season. 1.5 demo rating (0% change) with 2.65 million (+7% change). Season averages: 1.73 in the demo with 3.01 million. 1.5 demo rating (-12% change) with 2.47 million (-19% change). Season averages: 1.80 in the demo with 3.13 million. 1.7 demo rating (-23% change) with 3.06 million (-21% change). Season averages: 1.95 in the demo with 3.45 million. 2.2 rating in the 18-49 demographic with 3.85 million total viewers. Season averages: 2.20 in the demo with 3.85 million. It was a very good start for season two with the show registering its best ratings to date. Compared to the series premiere a year earlier, FX was up by 38% in the demo (vs a 1.6 rating) and up by 21% in viewership (vs 3.18 million). Reference point: The first season of American Horror Story averaged a 1.6 rating in the 18-49 demographic with 2.82 million total viewers. What do you think? Do you still like the The League TV series? Do you think that it should be cancelled or renewed for a fifth season? I never watched the series until I came upon it on Netflix the other day. It was Season 1, which after watching the pilot I couldn’t stop until I watched every evisode. I loved it. I have been looking for back episode’s of Season 2 but have been unable to find them. I sure hope it is as good as Season 1, but from the comments I have read it doesn’t quite measure up. Still would like to watch back episodes of Season 2. Anyone have any links to these episode’s? They have really jumped the shark with season 2. Watched for 5 weeks hoping it would get better and instead it got worse. Went from clever and creepy to cliche and disgusting. I really loved this show last season, and looked forward to every episode! So far, this season is not quite living up to its’ potential! I will continue to watch, I adore the cast, but I really do hope it gets a little better!